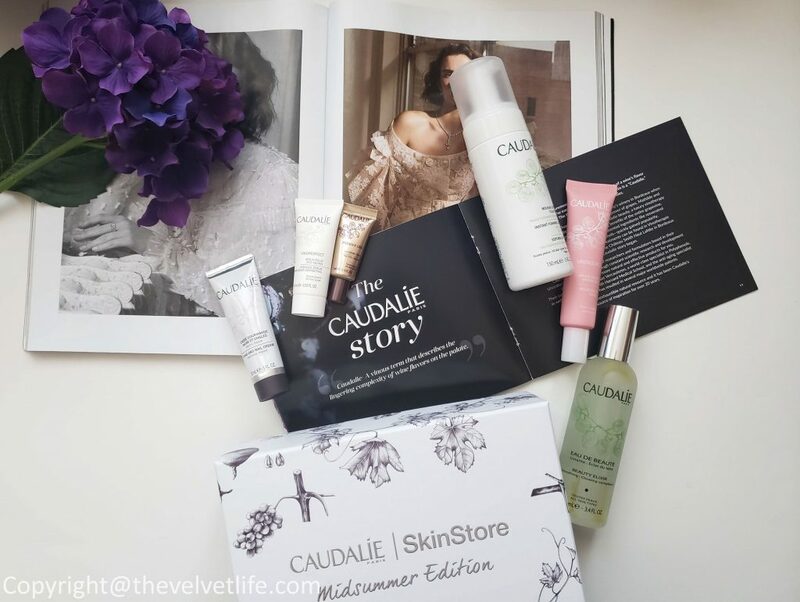 SkinStore has teamed up with Caudalie – for the second time to create an exclusive, limited edition beauty box. I mentioned ‘second time’ explicitly so that you know how popular and loved it was that it was sold out in less than two weeks. 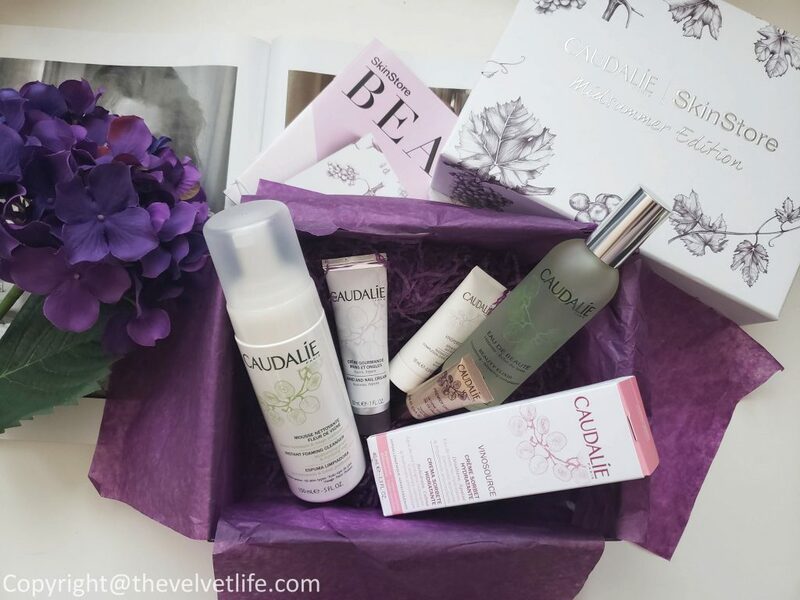 Caudalie is a cult skincare brand that draws its inspiration from French Vineyards, creating rejuvenating and radiance boosting products that harness the anti-oxidant qualities from the entire grapevine. And if you are not aware, Skinstore has been around for the last 20 years and is the number 1 destination for premium beauty and the latest in innovative clinical skincare and luxury spa products. The limited edition mid summer box is a premium arrangement that includes the products all housed in a gorgeous, newly designed box. 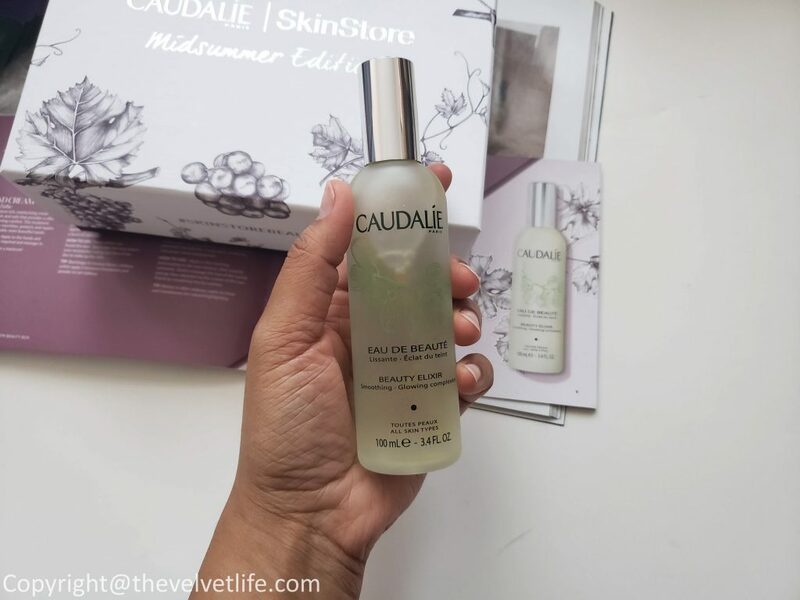 Vinoperfect Serum (10ml) is one of Caudalie’s best selling serums, this premium skincare product prides itself on keeping your skin moisturized, luminous and beautifully radiant. 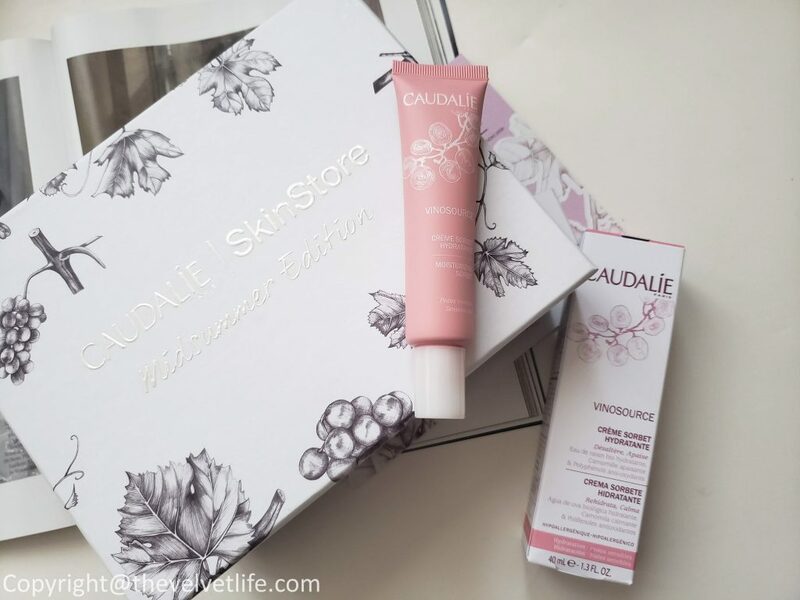 Containing Caudalie’s remarkable formula harnessed from the power of grapes and grapevine from their French vineyard, the Caudalie Vinoperfect Radiance Serum can be applied morning and night to enhance radiance, tone, and clarity. Instant Foaming Cleanser (150ml – full-size) is 99% natural, soap-free liquid cleanser turns into a generous, airy foam for gentle, effective cleansing. A natural blend of Grape Extracts, Sage and Chamomile effectively cleanse and removes makeup and impurities while soothing skin. The improved formula is now more natural, more effective and gentler on the skin. It can be used by all skin types including sensitive. Vinosource Moisturizing Sorbet (40ml – full size) is an astonishing gel-cream which breaks into water when in contact with your skin. It works to soothe, hydrate and fortify your skin with its 98% natural formula. It is ideal for sensitive skin, apply to face and neck morning and night, or as desired. Hand and Nail Cream (30ml) is an antioxidant, moisturizing hand and nail cream provides silky hands and lasting comfort. Concentrated with moisturizing active ingredients plus anti-oxidant grape Polyphenols and reparative organic fair trade shea butter, this hand and nail cream leaves skin soft and nourished. Its delicately perfumed rich texture is instantly absorbed into skin. Beauty Elixir (100ml) is inspired by the “elixir of youth” used by Queen Isabelle of Hungary, this skincare smoothes features, tightens pores and provides an instant burst of radiance to the complexion. Premier Cru Eye (5ml) is a lightweight formula that is gentle on delicate skin. The deeply nourishing eye cream melts into skin instantly to deliver noticeable anti-aging benefits, soothing puffiness and reducing the appearance of dark circles. Infused with soft-focus pigments, the treatment imparts a radiant, natural-looking glow that leaves eyes looking brighter, wide-awake and years younger. It is suitable for even the sensitive eyes. Beauty Elixir is one of my favorite mists that is perfect to use after cleansing, before the serum or moisturizer, after makeup, mid-day refresher, it works great to refresh and renew the skin and senses. I have used Vinosource Moisturizing Sorbet in the past and really liked it, it is so lightweight, never breaks out my skin and hydrates the skin adding radiance. Hand and Nail Cream is a must for all the seasons and especially that now fall is here and winter is approaching soon, it is so moisturizing hand cream and never gives that oily or heavy feeling. instant foaming cleanser is a nice addition to my cleansers and I am really enjoying how refreshing it is and my skin feels clean. Premier Cru Eye cream is one of their most raved about eye cream, I have heard great reviews on it and I am so excited to try this. Vinoperfect perfect is one of their best selling serum and no doubt how luminous and radiant the skin looks with it. 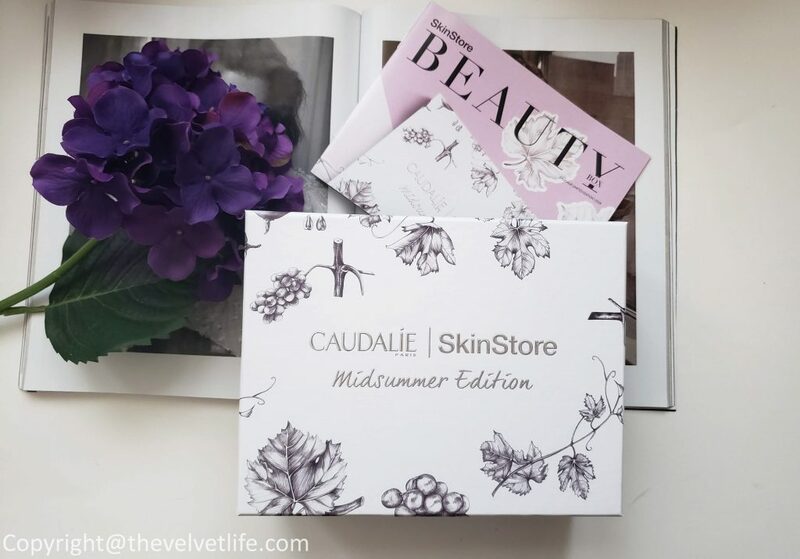 This Exclusive Skin Store X Caudalie Limited Edition Beauty Box – Midsummer Edition with $198 value is available for $55 on SkinStore. It is a great way to try the most raved-about and best-selling products from the brand through a box like this. The box was a major success and is already sold out, hopefully, it comes back in stock again. I have a special offer code to share with you guys. Offer: Receive $20 OFF an Exclusive SkinStore Limited Edition Box using the code BOX20 at checkout OR Receive $40 OFF 2 Exclusive SkinStore Limited Edition Boxes using the code BOX40 at checkout!